Zenway Digital Concepts & Design Center with Independent Creative Concept Photography is a small & independent private digital concepts & design center consultancy and contractor with current specialty Product Development ranging in and Trademark Specialist with Creative Unique Photography in Bicol Region. 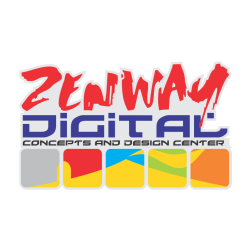 March 2007 the Zenway Digital Concepts & Design Center was established, with a small design group and a trained designers on their specialized fields of expertise. Our clients are within the Bicol area regional, national and international, but we are expanding thru e-commerce for our expertise in the field of designs. Using state of the art equipment and tools for our designers as a result we have made a great impact on our designs. We are located in the heart of Bicol - Legazpi City, with a view of the beautiful & Majestic Mayon Volcano, & the church of St. Raphael Archangel as it was used to create this company brochure v3.07. Roy B. Magdaraog have been trained by the PDDCP (Product Development & Design Center of the Philippines) in 1993 as a Product Specialist, & Design Consultant on GTH-Gift, Toys and Housewares, n; Packaging and Labeling, Furniture and Furnishing, and work on some of the Advertising Agencies here, & have been a free-lance & on-call designer for some of the Government Agencies, Private Company's, Schools, Colleges & Universities in Legazpi. Also a Senior Product Designer & member of the BIDEAS (Bicol Designer’s Association, Inc.) Vice-President-2007 to 2009. Still Active product development designer for local, national and international client. Updates our design trends from time to time. All design concepts and consultation is a high-end and quality assured for clients. Now a member and a core group of the 4A+2 Designer's Group and combination of talented Luzon Area Designers. 2011 designer's pool member on Manila base product development and consultancy firms. All material on this website is the property of © Zenway Digital Cencepts & Design Center. All rights reserved. Non authorized use and copying of images and text is strictly forbidden.